By Donald Stalker, Forester, Kilmun. Benmore and Kilmun estates, of which James Duncan, Esq., is proprietor, are contiguously situated in the united parishes of Dunoon and Kilmun, in the Cowal district and southern border of Argyllshire, and for a considerable distance run along the Firth of Clyde. The total area of Benmore and Kilmun estates is 12,260 acres, extending from the Firth of Clyde to the north end of Loch Eck, while on the south it possesses the advantage of having partially for its frontier the River Eachaig, whose source is in Loch Eck, and, after meandering through and fertilising an extensive plain, falls into Holy Loch, to which and Loch Long, an opposite inlet from the Clyde, the estate has a frontage of five miles. About four miles in extent, running along the Holy Loch and Loch Long, has been feued and closely built upon with superior sea-coast summer residences; while immediately behind these there is a sloping belt of full-grown larch, oak, and birch trees, which impart ornament and afford shelter to the houses below. Behind this lies the arable and grazing laud, which has a gradual ascent to the base of a wide curving range of hills, and terminating at an elevation of 1800 feet. The northern boundary of the estate, extending along and rising abruptly above the western margin of Loch Eck for a distance of seven miles, is a continuous chain of hills, the highest being Benmore, about 2500 feet high, and anciently known as the Deer Forest of Argyll. The soil consists chiefly of light sandy and gravelly loam, lying on slate rock, alternating with narrow veins of quartz,— the prevailing substratum throughout the entire estate. On the surface abundant evidence is given of the excellence of the green pasture, and but for the presence of brackens, which abound in many parts, suppressing the grass, the soil is otherwise admirably adapted for grass. Benmore House is situated near the south end of Loch Eck, and head of the extensive, undulating, and fertile valley of Eachaig, the greater part of which until recently was in a wild state of nature, overgrown with brushwood, heather, and rushes. On it Mr. Duncan now grazes his celebrated West Highland cattle and blackfaced sheep, which acquired such celebrity at the Paris International Exhibition in 1878, and continue to carry off the first awards at the annual exhibitions of the Highland and Agricultural Society of Scotland. 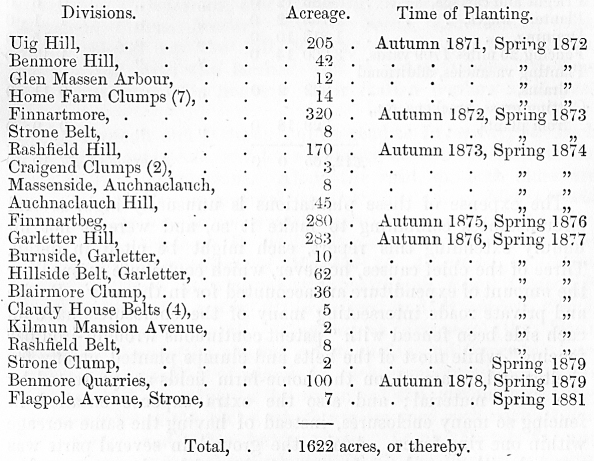 In 1870, when the proprietor obtained possession of the estate, he resolved on effecting extensive improvements; but preparatory to commencing operations, arrangements of a most amicable nature were entered into with a few of the tenants to give up such portions of their hill pasture as Mr. Duncan considered should be planted. With three of the largest grazing farms on the estate in his own hands, Mr. Duncan was enabled, both by tile-draining and ploughing, to bring under cultivation all waste lands adapted for that purpose; while on moorish wastes and portions unreclaimable he planted. And in testimony of the extreme suitability of both soil and climate for growing wood, the following statements may be narrated. About sixty-five years ago, on the base of the hill immediately behind Benmore House, where previously only a surface herbage of coarse grass, brackens, and heather existed, 55 acres or thereby were planted with larch, Scotch fir, Norway spruce, and several species of hardwood, chiefly with the view of contributing to the amenity and shelter of the house,—the present average value of which per acre is £70, and, since planted, it has yielded an annual rent of over 25s. an acre. 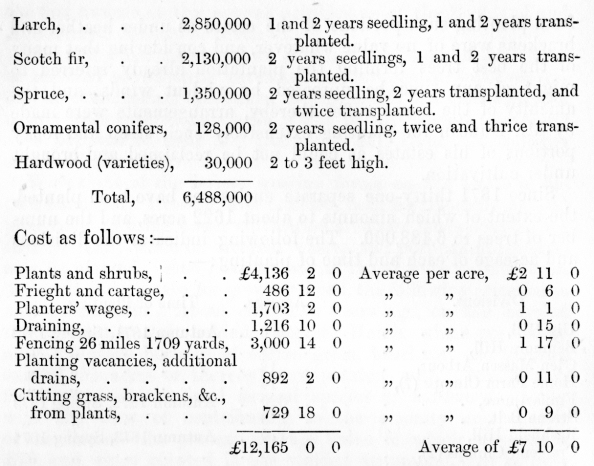 Thinnings have from time to time been cut during the last ten years for estate purposes, the money value of which would not be less than £500; and although it is impossible now to ascertain the actual value of the thinnings antecedent to 1870, it may reasonably be assumed they would have been sufficient to defray the outlay of capital on formation. The trees are with few exceptions healthy, and where the soil and subsoil are of a sandy, gravelly, and porous nature, still growing vigorously; but in some parts at the top of the enclosure, where the surface soil is mossy, retentive, and resting on rock, the larch trees are very diminutive, having scarcely made any growth for years, and some are disfigured with wounds known as "larch blister," and gradually decaying, giving evidence to the fact that the planting of larch trees on exposed rocky ridges, meagrely covered with inferior soil (indeed, in all adverse soils and situations), is the chief cause of the many diseases to which that very valuable tree is subject. The ground on which these trees now stand was, before being planted, almost valueless for grazing purposes, but so transformed has it now become as to be yearly worth 10s. an acre, and on it are grazed nearly all the year round a number of young Highland cattle; thus showing the profit and advantage of planting ground otherwise lying waste, over and above what was necessary for ornament and shelter. With such conclusive proof of the advantages to be gained from planting such portions of the estate as under heather and brackens were of no value whatever, and considering that many of the best trees forming the plantation already referred to might at any time be uprooted by violent winds, and the amenity of the house suffer thereby, arrangements were made by Mr. Duncan for planting extensively such steep and rocky portions of his estates as could not be reclaimed and brought under cultivation. The expense of these plantations is unusually high, several circumstances combining to make it so, and were it not for unduly extending this report, each might be cited in detail. Three of the chief causes, however, which contribute in swelling the amount of expenditure are accounted for in this way: Public and private roads intersecting many of the enclosures, have on each side been fenced with "patent continuous wrought-iron bar fencing," while most of the belts and clumps planted, chiefly for shelter and ornament, on the home-farm fields are protected by the same material; and also the extra expense entailed in fencing so many enclosures, instead of having the same acreage within one ring fence. Again, the ground in several parts was covered with a rank surface vegetation of brackens, grass, &c, so hostile to the growth of young plants, that strong large-sized plants had to be used; while on exposed, wet,. and retentive portions close planting and extensive drainage had to be resorted to. A description of the soils, species of plants, altitudes, and fencing, mode of draining and planting, will now be given. Uig and Rashfield plantations are situated to the east of the river valley of Eachaig, opposite Benmore House, with a north-western exposure, and at an average height of about 450 feet. The ground is steep, undulating, and rocky. The surface soil, consisting of sandy peat, is on the ridges and tops of precipitous rocks coated with heather, while the intervening hollows are of an open, sandy, and gravelly nature, and covered with brackens and grass. The substratum consists of clay-slate and quartz rock alternating, and prevailing throughout the entire estate, with but a few narrow seams of whinstone. 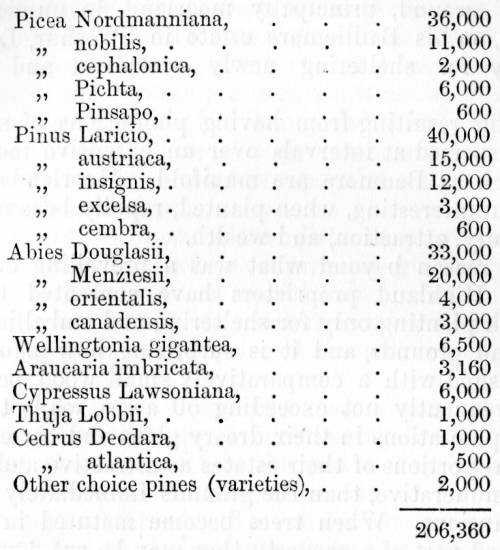 Turning attention again to Uig and Rashfield plantations, on the ridges of which native Highland Scotch pine, Pinus Laricio, P. austriaca, and P. montana, with a mixture of mountain ash, have been planted, and into hollows, or wherever the adaptation of the soil was favourable, larch was planted, interspersed at distances of from 15 to 30 feet apart, with several varieties of coniferous and deciduous trees, including P inus insignis, P. excelsa, P. austriaca, P. Laricio, and P. Strobus, Picea Nordmanniana, P. pectinata (common silver fir), P. balsamea, and P. nobilis, Abies Douglasii and A. Menziesii, Cedrus Deodara, Purple beech, and scarlet oaks. While higher up the hill, Norway spruce and Scotch firs, were mixed with the larches, and in places where brackens and grass fought for mastery, black Italian poplars and sycamores. The Dunoon and Kilmun public road to Inveraray, via Loch Eck, partly intersects, and for a distance of two miles skirts the base of these plantations. Along the road, on both sides, are grouped together ornamental conifers, including Wellingtonia gigantea, Araucaria imbricata, Cedrus Deodara, C. atlantica, Picea Nordmanniana, P. nobilis, P. pectinata,, P. lasiocarpa, P. Pinsapo, Abies Douglasii, A. Menziesii, A. Albertiana, A. Englc-manii, A. nigra,, A. alba, and A. Smithiana, Pinus Laricio, P. Benthamiana, P. exeelsa, P. austriaca, and P. cembra, Thuja Lobbii, Thujopsis borealis, Cryptomcria japonica (the Japan cedar), C. elegans (the elegant cryptomeria), and Cupressus Law-soniana, the number of plants in each group varying from five to a hundred, according to the extent of the various nooks and recesses between the rocks, which are crowned with native highland Scotch and other hardy pines. Larch, Scotch fir, and Norway spruce have been planted in all the groups, to shelter the tender plants. These trees have also been planted into groups by themselves on marginal parts of the plantations, partly for ornament and also to test their adaptation for becoming profitable timber trees in this country, and for the latter purpose they have been placed well back off the boundary fences, and at intervals of about 12 feet apart. The borders of the plantations near to public and private roads are, immediately behind the fencing, lined with deciduous trees, evergreen and flowering shrubs, comprising purple beech, walnuts, purple and variegated planes, scarlet oak, common hawthorns, single and double flowering scarlet hawthorns, common and golden laburnums, lilacs, bay and Portugal laurels, common and variegated hollies, Rhododendron ponticum, Mahonia aquifolium, cotoneasters, and other ornamental trees and shrubs. Great care has been bestowed on these plantations. Additional drains have been made, and all blanks planted up; and what was some nine years ago the most bleak and uninteresting hillside is, now that the young trees are developing with vigour and uniformity, most imposing and picturesque. Another improvement has been effected on this part of the estate, and one which contributes in no small measure to its attractions. A bridle path, five feet wide and nearly two miles in length, has been lately constructed, at a cost of 2s. per lineal yard, including rustic wooden bridges which span the burns. The path diverges from the public road opposite "Loch Eck porter's lodge," and curves up through the plantation and across the face of precipitous rocks with an easy gradient, till it reaches the south side of it, at an altitude of 600 feet. At this point it connects itself with a road one mile in length, and quite recently formed along the course of Uig burn. Entering the glen at the top of Uig and Rashfleld plantations, we follow the course of the burn which divides these, and although our eyes can no longer feast on distant scenery, fresh beauties and grandeur are here disclosed to view. Between huge overhanging rocks, in the crevices and sides of which are an endless variety of ferns, mosses, and other Alpine plants, the burn flows rapidly down in a series of waterfalls ; and the road which leads into the nurseries is shaded over its entire length with oak, elm, alder, birch, mountain ash, and hazelwood. Wel-lingtonia gigantea, Picea Nordmanniana, and many other ornamental conifers, have been planted into recesses in the rocks in this glen, which for wildness and grandeur is by few equalled, and certainly by none excelled in the west coast of Argyllshire. In the home-farm fields the trees planted in clumps are making rapid progress. The soil is various, consisting of hard gravel, other parts of sand, and along the margins of the river and throughout the largest portion of the farm the soil is moss, mixed with a fair proportion of sand. As already stated, the fields in Eachaig valley have but very recently been reclaimed, and a most interesting illustration of the good effects of cultivation is here shown in the contrast between the luxuriant crops of corn, ryegrass, and turnips, which surround the clumps; while round the young trees, which stand from 6 to 10 feet high, there is a covering of rank heather nearly 2 feet in height. Finnartmore and Finnartbeg plantations are contiguously situated on an eminence confronting the Holy Loch and Firth of Clyde at an average height of 550 feet. The ground is steep, yet comparatively regular and smooth on the surface. The soil, which is covered with grass, brackens, and heather, seems admirably adapted for the growth of timber, being a rich gravelly loam resting on a subsoil of gravel and rocky debris, and being naturally dry, comparatively few drains were required. From the base upwards, two-thirds of the grounds have been planted chiefly with larch; while the higher slopes and summits are planted with native highland Scotch pine. Evergreen and ornamental conifers, including 8000 Picea Nordmanniana, and clusters of mostly all the hardier species of the silver fir, pine, spruce, cypress, and cedar, have been interspersed among the larch, at distances varying from 15 to 30 feet apart, so as to give some verdure during the winter months, and also to have a variety of profitable timber trees growing on the ground after the larch trees are removed. Norway spruce has been planted almost exclusively on patches growing a strong vegetation of grass, brackens, and rushes; while on rocky parts, thinly covered with mossy soil, native highland Scotch pine was planted. As in the case of Uig and Rashfield, these plantations have been carefully gone over a second time, and attention bestowed on wet and blank spots. The trees are all healthy, and making rapid progress. The larch, Abies Douglasii, A. Albertiana, Thuja Lobbii, Pinus Laricio and P. insignis, which grow apace in congenial soils and favourable situations, have now reached a height of from 10 to 12 feet. The other pine trees, although not so high, are growing rapidly, and appear in perfect health. Previous to being planted, the ground presented a bleak, sterile, and uninteresting appearance, but now that it is almost clothed from base to summit (highest elevation about 1200 feet) with young trees, it is a pleasing object in the landscape along the Holy Loch and Firth of Clyde. Garletter plantations are so named by reason of their being in the glen of same name. The exposure is easterly, at an average height of nearly 600 feet. The largest division is situated on the eastern extremity of Kilmun estate. The surface-soil consists of decomposed sandy peat, resting in turns on rock and yellowish gravel, and mostly covered with grass. From the wet and retentive nature of the ground, close and extensive draining had to be resorted to, yet it withholds the needful sustenance from the young trees, especially on high and exposed parts. After a time, however, when the plants attain such dimensions as to cover the ground, and thereby suppress the strong grassy vegetation, they may be expected to grow as well as trees in the more favourably situated plantations. In kindly soils, which contain a larger proportion of gravel and sand, and consequently are drier, the larch, Norway spruce, and Scotch firs are growing satisfactorily. Auchnaclauch plantations in Glen Massen have a northwestern exposure, and an average height of 250 feet, and in respect to both ground and plants they are very much similar to Uig and Rashfield. Glen Massen arbour plantation is within the Benmore policies, with a north-western exposure, and an average height of 150 feet. The trees are very thriving, and making rapid progress, particularly the larch, Abies Douglasii, Picea Nordmanniana, and Scotch firs. Benmore hill and Benmore quarries plantations are situated side by side on the hill immediately behind Benmore House, with a south-eastern exposure, and an average height of 450 feet. The ground and general state of these plantations is very much similar to Uig, but differs in this respect, that Benmore quarries plantation is not so far advanced, having only been in existence for three years, and also that it contains more Abies Douglasii than the others. Forty thousand of these were planted as an experiment, and in congenial soils and sheltered situations have made magnificent progress; but on exposed sites they have, with few exceptions, been deprived of their tender tops by the frosty winds. Craigend, Strone, and Blairmore belts and clumps were primarily designed for shelter and embellishment, and were placed at judicious intervals on the grazing fields, in close proximity to the summer residences along the sea-shore. All the trees give evidence of health by their rapid growth. Fencing.—Uig and Rashfield plantations are, on each side of the public road, protected by "continuous wrought iron flat bar fencing," which cost from 2s. 9d. to 3s. 6d. per lineal yard, according to the state of the iron market at the time the fences were erected. Uig plantation, on the northern extremity of Kilmun estate, has a march fence constructed solely of iron, 3½ feet above ground, with seven wires (of No. 5 and No. 6 best bright wire) laced between the standards, with No. 8 wire fastened to top and bottom wires; wrought iron standards, 1¼ inches broad by | inch thick, batted into stones placed 7 feet apart, with iron side-stays 5/8 inch square at every fifth standard in curving parts of the fence; one wrought iron straining pillar, 1½ inches square at 100 yards or thereby, which make it a most substantial fence, scarcely ever out of repair, and therefore most suitable for the boundary of an estate. The cost was 1s. 6d. per yard. On the upper and side boundaries there is a six-wire fence (of No. 4 and No. 5 best bright wire) stapled to larch posts 5½ feet long, pointed and driven into the ground at 5 feet apart, with a larch stay at every alternate post. This fence, which cost 9d. per yard, is a most servicable one, and by the time many of the posts require replacing, thinnings from the plantation will be of a sufficient size for the purpose. Rashfield, on the upper and side boundaries, is enclosed with a six-wire fence (of No. 5 and No. 6 best bright wire) 3 feet 4 inches high; iron standards, 1¼ inches broad by ¼ inch thick, batted into stones placed 6 feet apart; iron straining pillars 1½ inches square. The cost per yard was 1s. 5d., and it is a most durable and sufficient fence. Finnartmore and Finnartbeg are in part protected by a wire fence 3 feet 4 inches high, and by a rough stone dike 4 feet high, on the top of which is a double line of wooden rails nailed to larch posts, and reclining against the dike on the inside. The fence is a six-wire one (of No. 4 and No. 5 best bright wire), with iron straining posts on the summit, and larch ones along the base and west side of the enclosures. The cost was about 8½d. per yard. Benmore hill and Quarries plantations are surrounded by a common six-wire fence, larch posts and straining posts, and in part by the Corriemony fence. Auchnaclauch plantations have been enclosed with iron and wire fencing, similar in every respect to that of Rashfield. Garletter plantations are enclosed with "Corriemony fencing," 3 feet 3 inches high above ground, with angle iron standards batted into stones at 22 yards apart, with six steel wires of Nos. 8 and 9, stapled to larch droppers at 6 feet apart; iron straining pillars at intervals of 200 yards, with an iron stay to every standard. The cost was 7d. per yard, but soon proved itself unable to withstand the wintry storms, which levelled considerable portions of it on the most exposed sites; and, although intermediate standards were at once put in, placing them at 11 yards apart, yet it is still insufficient and constantly requiring repair, which, owing to the brittleness of the material, is difficult to do. All these fences, in the present state of the iron market, could now be constructed cheaper. Draining.—The ground was drained by contract, and also by men employed at a fixed rate of wages per day. The method adopted in draining the steep and rocky enclosures was, by having all the wet ground drained by "surface drainers," who, with "big spades" and other tools adapted for that purpose, performed the work far more expeditiously and at less than a fourth of the price than could possibly be the case by using the ordinary spades or shovels. The drains were made from 2 feet to 2 feet 3 inches wide at top, 18 inches deep, and 6 to 8 inches broad at bottom, in places where the soil admitted that depth. The cost of making was from 1s. 9d. to 2s. 6d. per 100 yards, according to the soil. All parts which required deepening were subsequently gone over a second time by day labourers, and sunk with pick and shovel a sufficient depth into the subsoil. In deep loamy and mossy soils open drains were formed by contract, and also by day labourers. The dimensions of the drains were from 2½ to 3 feet broad at top, 2 to 2 feet 9 inches deep, and 6 to 9 inches broad at bottom, according to the soil. The cost was from 9s. to 12s. 6d. per 100 yards. All the soil taken out in forming the drains was spread over the surface of the ground. Planting.—Planting operations were performed under the constant supervision of the forester and an assistant. The plan devised for transporting the plants to their new habitation was carried out in the following way. But first of all, and in nursery phraseology, the plants were properly "shouched" into dry ground at the base of and within the enclosures. Four Shetland ponies, on whose backs pack-saddles were strapped, and into which the bundles of plants were placed (roots inward), proceeded on their march up the hill in pairs, each being tied to the other's tail, and under the charge of a man and boy. On reaching their destination, the plants were again "shouched" close to where the planters were at work. Pits were formed for deciduous broad-leaved plants, and also for ornamental and expensive pines, which were interspersed amongst the others in suitable soils at moderate altitudes, and at distances varying from 12 to 30 feet apart. The usual number of men in one squad, notching the plants into the ground with common garden spades, was about a dozen, and two lads were fully employed in keeping up the supply of plants to the hands of the boys and girls, each of whom inserted them into the slits or notches made by every two men. The plants were placed at from 3 to 3½ feet apart, or an average of 4000 to the acre. The situations and boundaries of the plantations were carefully laid off, with the view of providing shelter for the flocks on the adjoining grazings, and to promote this object the fencings were carried along in curving lines, thereby forming a series of spacious recesses, into which the flocks might congregate in snowstorms and inclement weather during the lambing season. The nursery also contains a collection of hardwood plants, besides an extensive stock of true native Highland Scotch fir. The situation of Benmore House is a most desirable one. The gardens, greenhouses, and fernery are of themselves sufficient to attract the admiration of visitors to the locality. But another and still greater treat has been provided for them. It consists of a picture gallery erected in 1879-80, and is situated in close proximity to the house. In length it is 150 feet, by 60 feet broad, and 40 feet high. The walls are adorned with most interesting and valuable works of art, many of them being extra large-sized paintings by some of the most eminent ancient and modern masters; while the centre of the gallery is filled with statuary, embowered with crotons, palms, ferns, and other graceful foliage plants. That the public evince a due appreciation of this splendid acquisition to Benmore House is evident from the fact that hundreds of people are availing themselves of the liberty at all times granted of inspecting the gallery. The policies are extensive and exceedingly interesting, being intersected by two rapidly flowing rivers, Eachaig and Massen, in both of which salmon abound. About four acres of ground, stretching along the sides of Loch Eck Avenue and Echaig riverside, have been formed into a pinetum, and three acres along the banks of the Massen are being gradually converted into an arboretum by the introduction of duplicate and single specimens of all the hardy trees known in Britain. Mr. Duncan has also planted within the last six years about 30 acres of ground, principally moorland, in numerous belts and clumps, on his Bailliemore estate in Strachur, Loch Fyne-side, chiefly for sheltering newly reclaimed and improved parks. The benefits resulting from having plantations of serviceable timber interspersed at intervals over an extensive mountainous property such as Benmore are manifold. Moorlands the most sterile and uninteresting, when planted, rapidly become a source of great beauty, attraction, and wealth. From no reason beyond what was a prevailing custom, the majority of Highland proprietors have contented themselves hitherto with planting only for sheltering and embellishing their mansions and grounds, and it is surprising how many of them are still satisfied with a comparatively small wood behind their dwellings, frequently not exceeding 50 acres, while they might by forming plantations in their dreary glens and barren hillsides make several portions of their estates as attractive and, certainly far more remunerative, than the grounds immediately surrounding their mansions. When trees become matured in a glen or other secluded part of a property, they may be cut down without in any way detracting from the general aspect of the estate. Several extensive landed proprietors at the present time being well aware of the advantages to be derived from the planting of moorlands, have placed large tracts of their properties under forest trees, and none of them will ever have occasion to regret this, as it increases their revenues and greatly improves the soil for pasturing purposes, as well as the climate.